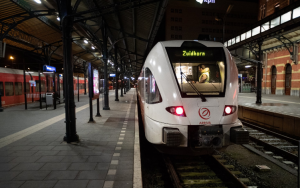 ProRail, the Dutch railway infrastructure manager, in collaboration with Arriva and Stadler, successfully conducted trials of a passenger train equipped with Automated Train Operation (ATO). The test was made on March 5, on Groningen – Zuidhorn railway line, in Northern Netherlands. During the test drives, precision stops were performed at Groningen, Hoogkerk and Zuidhorn stations. According to the results, the tests shown that ATO system is compatible with passenger trains. “The first test results are hopeful. The test has shown that ATO is suitable for passenger trains on the Dutch railways,” ProRail CEO, Pier Eringa, said. The Arriva’s train, manufactured by Stadler, is equipped with Grade of Automation 2 (GoA2), that requires the presence of a train driver in the cab. The ATO tests on the Groningen – Zuidhorn railway is the second project of ProRail in order to implement the automated train traffic on the Dutch rail network. In December 2018, ProRail, in collaboration with freight transport provider Rotterdam Rail Feeding carried out an ATO Level 2 system trial on a locomotive from Alstom on the Betuweroute freight line. The locomotive run on a 100-km distance and the test was declared as a successful one.